I know there's been a vast bloggy silence lately and I have no excuse. Lots of non-life-threatening but time-sucking stuff– Roo's 5th birthday*, nice weather, my ongoing thyroid nightmare (I've been on medication for hypothyroidism since Roo was born and apparently my dosage has made me fat, tired and crazy)– has converged to form a giant case of writer's block that I am trying desperately to work past since I have a lot of very cool stuff to review and give away… I hope you'll stick around to see what's coming. *I still haven't made her thank you notes (Bad mommy!) 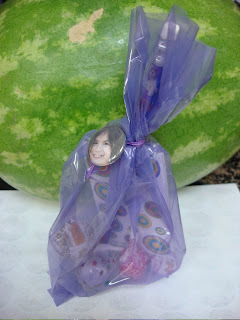 yet but look how cute the goody bags turned out. Oh Naomi. What a pretty, pretty basket of goodies. It looks like a basket of violets and the backyard looks so pretty.. I'm sorry to hear about your medical issue. I hadn't known Naomi. I hope you've been to see the dr. recently? You have been very missed. Do not ever do that again. And anyway, I thought you were some sort of superhero. 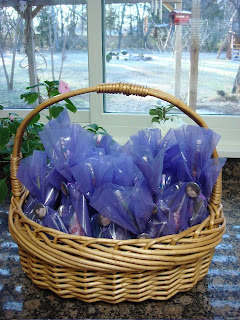 The goody bags look fabulous, you're a better mommy than I! Don't fall into the "bad mommy" trap, puh-leeze girlfriend! It has only been like 2 weeks, you still have plenty of time to get those thankyou's out! Those are some lovely goodie bags, I bet kids were thrilled to get them! I would love to email with you sometime about thyroid stuff. They can't decide if I am hypothyroid or not, I have all the funky symptoms. I hope you start feeling better soon. Those are adorable. Happy 5th Birthday to Roo! Um, I think I hold the record. In my purse (why? is there a rush?) I still have an envelope with the gifts received and givers' names scribbled on it from Lila's 7th birthday. Thank-you notes have yet to be written. She turned 8 in August. Needless to say, those notes have not been written, either. (I do have 4 kids, and the last two are still toddlers -- that's my excuse, and I'm sticking with it!). I've missed you, although I totally can relate to being busy with birthday stuff, etc. Those bags turned out so great! I love the little Roo button on them. Great idea! OMG those are so cute! They just upped my dosage turns out i'm also a nut. We can go crazy togetehr!